I have had a terrible cold all weekend. I am thankful that Christine left me a comment about Breathe Right strips! Marcus got me some and they worked great! I love all you blog friends that take care of me! Marcus also got me some other medicines and a Coke Slurpee! Those can cure anything! He is STILL in paramedic school and now has to work at 5 different hospitals for a month. So he was working most of the weekend. We had plans to go on a date Friday night, but I was pretty pathetic. We still dropped Katie off at his mom's house and just went for a drive. 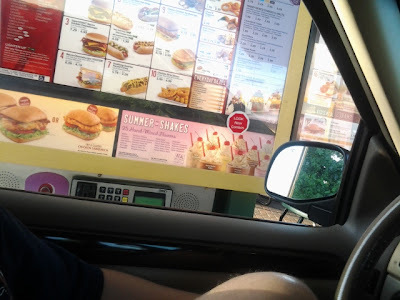 We ended up at Sonic to sample 2 of their 25 flavors of shakes. I got peanut butter fudge! Yum! I have a feeling we will be meeting again sometime soon. Marcus got chocolate covered strawberry, but he wasn't in love with it. Anyway, we think dates are important and try to go on them at least twice a month. Next time I will leave the toilet paper at home! She's been hooked on painting ever since I let her paint pumpkins in October. So I got her some canvases and let her make some art work for me. I needed to fill a space on this wall, so I just chose the colors I wanted her to use. I gave her one color at a time, dried it with a hair dryer, then she started with the next color. If you are OCD, this project might put you in the loony bin. I am not OCD at all and there were times I wanted to be the boss of her painting, but I refrained. I'm glad I did, because I love how they turned out! I also got out of bed to go to my nieces' birthday party! Melissa is 14 and Jennifer is 19. They are the sweetest girls! Here they are with all their cousins! Katie was WOUND up and had a great time. She loves a good birthday party! 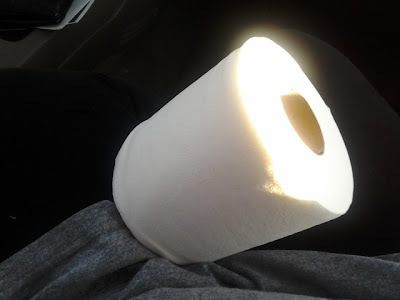 I am hoping for a healthier week, with less snot, and less toilet paper rolls in my life! You crack me up :-) Loved y'alls romantic date. Jealous of the sonic. Oh and I don't buy tissues either. Kindred spirits. Hope you're feeling better! And LOVE Katie's paintings! And we are the same way with the TP for Kleenex. I tried the Peanut Butter Fudge shake last week and it was pretty good. I think I'll try the Peanut Butter Banana next time, but definately not Peanut Butter Bacon. Yuck! I like them separate, but I don't know about together. I am dead set on trying the chocolate cream pie shake from Sonic. I swear I heard it whisper my name the other day straight off the menu.